The new AMS website will be launched in March 2017. The new platform suits all devices from large desk top computers, through Pads/Tablets and Smart Phones. The content rich AMS site has been reorganised to make it easier for you to navigate important resources that assist you in keeping up to date with current practice and better manage your patients. In addition to the popular Information Sheets, we have added a Health Information area which will contain Fact Sheets, videos and resources for your patients. The “Find an AMS Doctor” service has also been redesigned so that patients will be able to locate your practice via a map. Due to feedback from members, we will be changing the member login details from your AMS member number to your nominated email address. This will assist members to remember their login details and reset passwords more efficiently. 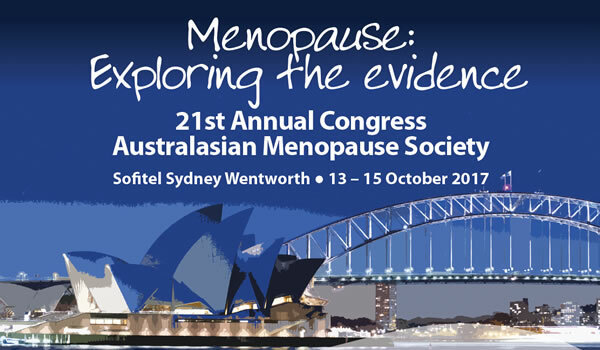 ...Culturally determined attitudes appear to affect the perception and experience of menopause. Other influencing factors include migration, women's roles, marital status, religion, use of herbal and traditional remedies, social situation, access to information, knowledge and experience of menopausal symptoms. Oestrogen therapy has already been credited with helping women manage an array of menopause-related issues, including reducing hot flushes, improving heart health and bone density, and maintaining levels of sexual satisfaction. This suggests that the same oestrogen therapy used to treat osteoporosis can actually lead to healthier teeth and gums. Women in menopause are likely to complain about hot flushes and an inability to lose weight, especially belly fat. A Spanish study shows how regular exercise can help reduce weight and control bothersome symptoms such as hot flashes, even in women who previously led sedentary lifestyles. Decreased estrogen levels during the menopause transition often create an array of physical and mental health issues that detract from a woman's overall quality of life. The article "Improvements in health-related qualify of life, cardio-metabolic health, and fitness in postmenopausal women after a supervised, multicomponent, adapted exercise program in a suited health promotion intervention: a multigroup study" reports on 234 Spanish postmenopausal women aged 45 to 64 years who had at least 12 months of sedentary behavior and engaged in a supervised 20-week exercise program for the study. Dr Sheryl Kingsberg Chief, Division of Behavioral and Professor in the departments of Reproductive Biology and Psychiatry at Case Western Reserve University School of Medicine and President-Elect of NAMS discusses the importance of and simple tips for taking a woman's sexual history. One of the main issues discussed in relation to postmenopausal hormone therapy (HT) is the risk for venous thromboembolic (VTE) events. In fact, this safety aspect of HT use is probably the only significant one in healthy women younger than 60 or during the first decade of use. Because misclassification of breast biopsies is relatively common, and no prior study had analyzed strategies for reducing error, the recent Elmore study is timely . Here, 12 different strategies for acquiring second opinions were compared in order to help define which strategies worked best to reduce misclassification errors. Asthma is basically an inflammatory disease, sometimes associated with allergy. Several publications have addressed recently the potential association between menopause and asthma. The latest study examined the possibility that there is a link between menopause and new-onset asthma : the Respiratory Health in Northern Europe study provided questionnaire data pertaining to respiratory and reproductive health at baseline (1999–2001) and follow-up (2010–2012).